It's not outlandish to suggest that Jordan Peele's audacious 2017 horror-satire, Get Out, helped galvanize a resurgence of the horror genre in 2018. 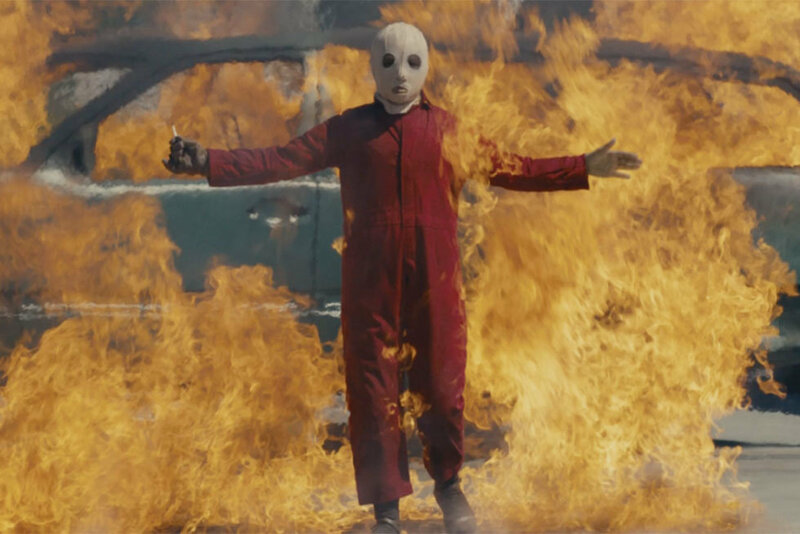 Filmmakers were emboldened to use horror as a conduit for social and psychological exploration in films ranging from the surrealistic nightmare of Sorry to Bother You (2018) to the inescapable fate of Ari Aster's Hereditary (2018). It's ironic that Peele's sophomore effort, Us, which follows a family confronting their evil doppelgängers, falls into many of the same repetitive traps that make standard horror films such a bore. Us is equally ambitious thematically to Peele's breakout debut, but lacks the same artistic focus and emotional resonance. Peele mysteriously abandons the rich social subtext he works so hard to establish in the film's opening moments in favor of a formulaic mid-section that bloats the film to a staggering two hours. 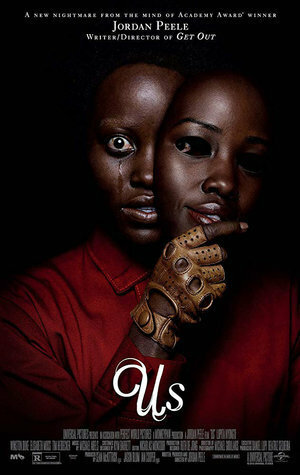 There are things to admire here, from the towering performance of Lupita Nyong'o to Peele's absurdist directorial sensibilities, but there's no escaping that Us is deeply flawed, rarely scary and, at times, deadly dull. We start at a sea-side carnival in Santa Cruz circa 1986, re-living the childhood memory that has scarred Adelaide Wilson (Nyong'o) for life. Wandering off alone into the hall of mirrors (first called 'Visionquest' and later re-appearing under the hilariously generic moniker of 'Merlin's Forest'), young Adelaide stumbles into a creepy little girl who looks just like her. As we come to discover, Adelaide's evil twin is only one of a group called "The Tethered"; twisted mirror images psychically linked to their social betters. These early sequences demonstrate what a virtuoso filmmaker Peele can be. His camera is fluid, but never frenzied. He can sustain a long tracking shot, crowd his actor with a claustrophobic close-up, and then zoom high above the landscape with a God's eye view… all in the same scene. In perhaps the film's most haunting composition, his camera slowly pulls back to reveal an expansive wall of caged rabbits, accompanied by a discordant soundtrack of chants and halting screams. It's a disorienting and arresting vision but it doesn't come across as pretentious; a balancing act few filmmakers can pull off. 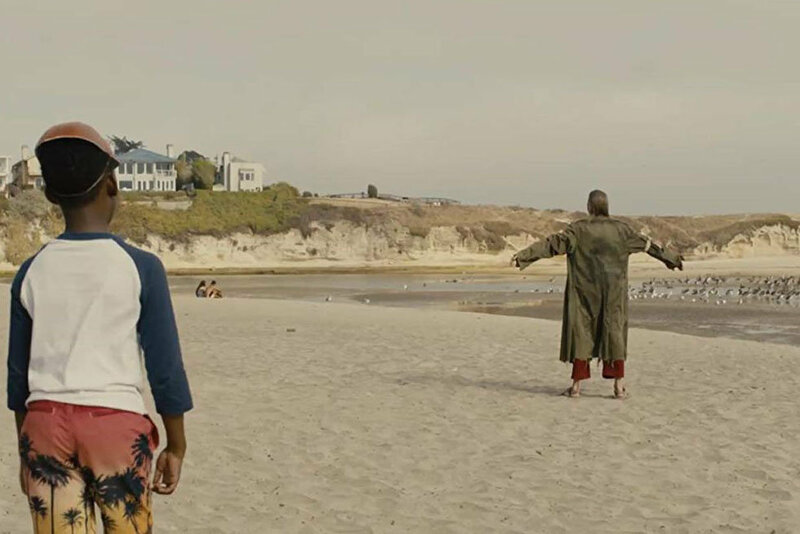 Returning to present time, Adelaide and her family – husband Gabe (Winston Duke), son Jason (Evan Alex) and daughter Zora (Shahadi Wright Joseph) – embark on a vacation to Santa Cruz, California. Adelaide is understandably reluctant to re-visit the beach that changed the trajectory of her life, and she refuses to acknowledge the growing realization that something truly terrible is lurking in the shadows. The emphasis on family dynamics is becoming one of Peele's hallmarks. While he continues to show the same patience he displayed in Get Out, allowing conversations and shared silences to unfold at their leisure, his comic roots are more evident in Us. More specifically, nearly every line of dialogue or non-verbal action delivered by Gabe is designed for comic effect. While Winston Duke is undeniably funny, Gabe as a character is so at odds with his ultra-serious surroundings that he appears completely out of place. The humor of Get Out flowed naturally from Peele's meticulous characterizations, but here it seems calculated and detached, as though Gabe exists only to provide ironic commentary on the carnage. This highlights a basic tonal inconsistency that plagues Us, where the constant quips distract from the skin-crawling visuals, often resulting in unintentional laughter. Given the abundance of disturbing imagery, it seems likely that humor was either not Peele's intention or it was woven ineffectively into his script. When the doppelgängers of Adelaide's family first appear – wreathed by fog and shadow as they hold hands while standing in the driveway – it's truly disconcerting. Whether it's the dog mask permanently affixed to the face of Jason's 'twin' or the dead-eyed stare of Zora's silent double, these creations are nightmarish, soulless manifestations of the evil lurking just below our civilized surface. At this point in Us, with our heroes staring The Tethered square in the eye, we feel the weight of Peele's churning social subtext. Truly, when a society subjugates and marginalizes huge swathes of its population, it is doomed to devour itself from within. The interconnectedness of civilization erodes and the mighty devolve into barbarians in order to protect their fragile artifice. It's a theme that weaves perfectly with Peele's nifty doppelgänger premise, promising plenty of biting insight mixed with bloody thrills. So why does Peele abandon this ingenious approach in favor of repetitive chase-and-escape horror tropes? If one didn't know better, they might assume studio executives had demanded re-writes of Peele's script to make Us a more conventional horror film. Adelaide and her family drive cars, boats, and even an ambulance to evade capture. And it goes on and on and on… until the delicate scaffolding created in the film's first 15 minutes collapses. Meanwhile, huge chunks of exposition from Adelaide's gurgling twin explain all of the scenes and plot points that were omitted in favor of pointless running around. There are brief moments of inspired weirdness – a figure lurking in the corner or a darting object skirting our peripheral vision – but scares are in short supply. Any sense of unease is squashed by the predictable rhythm of what's basically the same scene played out over and over again. It's a shame, too, because Lupita Nyong'o is eager to do so much more. She attacks the role of Adelaide like a live wire; a blur of desperation, fear, and raw anger. Nyong'o makes even the laughably bad vocal affectation of her doppelgänger believable, engendering a surprising level of empathy for The Tethered. Her strength and resolve are unwavering, even in a role that demands almost constant physical punishment. Calling Us a disappointment is an oversimplification. It's more of an incomplete thought; an ambitious draft with countless ideas and story threads that fail to tie together because of a flawed structure. Indeed, the more you think about Us, the more it unravels. Peele's stated intention was to produce a more straight-ahead horror film than Get Out. Unfortunately, he succeeded.